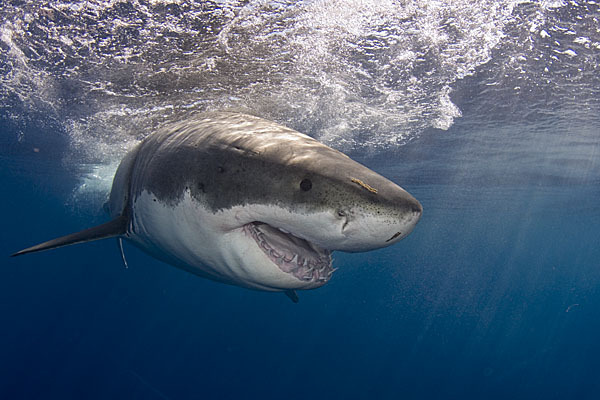 No epic shark diving road trip would be complete without an encounter with great white sharks. 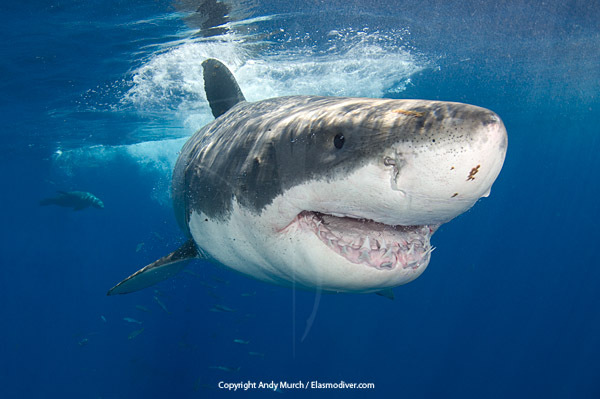 And, if you want to see white sharks in North America there is no better way than to join an expedition to Guadalupe Island with Lawrence Groth, the owner of Great White Adventures. 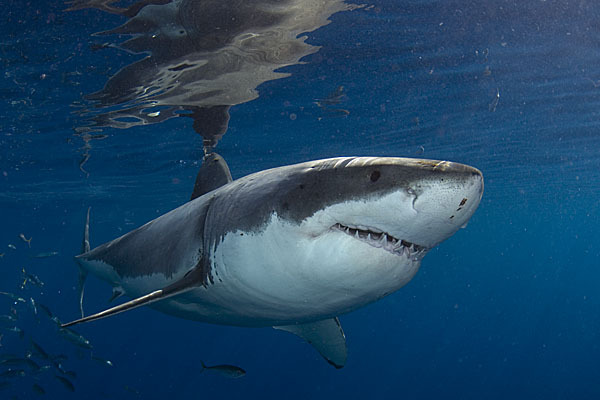 Lawrence pioneered the white shark diving at Guadalupe, transforming a virtually unknown fishing outpost into the world’s most productive and dynamic location for great white shark diving. So, after driving north through 2000km of Mexican desert, beach diving our way up the coast of California, hightailing it over the Rockies to catch up with the SDM crew in Louisiana, working with researchers in the Gulf of Mexico, circumnavigating Florida twice, scouring the continental shelf for whale sharks, diving with sawfish in the Georgia Aquarium, gunning it up to Rhode Island to shoot skates and catsharks, venturing to the very tip of Canada’s Gaspe Peninsula in a fruitless search for porbeagles and Greenland sharks and zigzagging all the way back to So-Cal to shoot makos, we found ourselves crossing back into Baja where it all began. After a smooth 18 hour crossing aboard the Solmar V, Guadalupe was just how I remembered it; a looming wall of volcanic rock sprinkled with mournful sounding pinnipeds. The surrounding waters were as cobalt blue and shark infested as ever. For three days we clung to the bars of Lawrence’s cages and watched the parade of white sharks go by. At one point we had four enormous great whites buzzing the cages from all directions. It was the most intense white shark action I have ever experienced. The sharks would appear from all directions in an attempt to outwit the bait wranglers. Consequently, I often ended up hanging half out of the shooting window in order to capture the action. 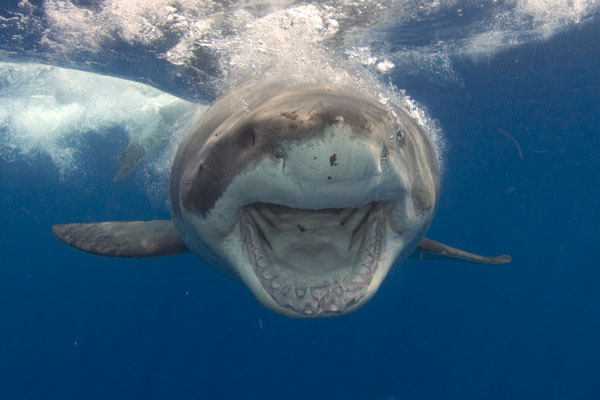 By the third day I had grown complacent which is a bad trait in a shark photographer. 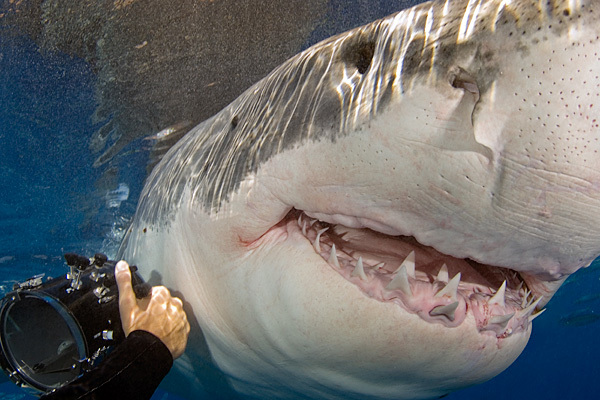 While filming a particularly close pass I turned at the last second and barely pulled my arm back into the cage before an enormous white shark named Zapata with teeth the size of Dorito chips, barreled past just a few inches away. Charged with adrenalin I fired off a quick shot of his awesome maw next to a tiny looking video camera that clearly illustrated the enormity of his features. 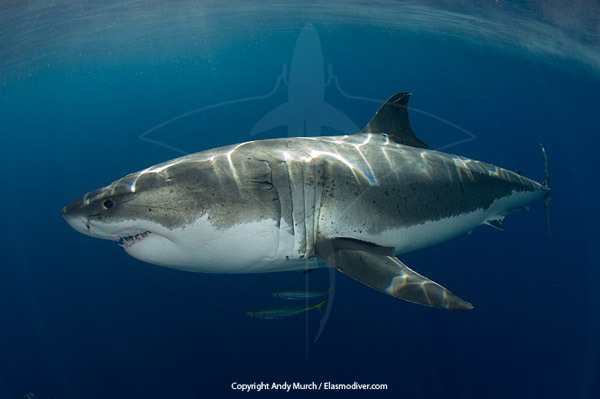 With scores of spectacular new white shark images added to our tour portfolio we decided to call it a day. It was time to pick somewhere to live and actually go there. Bidding Baja farewell for a second time, we headed north, bound for Vancouver Island. The 2400km drive up the west coast seemed trivial after the 24,000kms we had already completed. We should have made it in two long days but as we passed the Channel Islands, the siren song of the ocean distracted us once again. We stowed the van at a ferry terminal and slipped over to Catalina to hunt for torpedo rays and angel sharks. On the boat over it occurred to me that the shark tour would never truly be over. It might slow down a little now and then but as long as I can still kick and focus a camera, chasing illusive sharks will consume me to the end. Right now we are making plans for the fall of 2010. We came up with the crazy idea of driving all the way through Central America to Panama. The Predators in Peril Expedition will be far more ambitious than the shark tour. 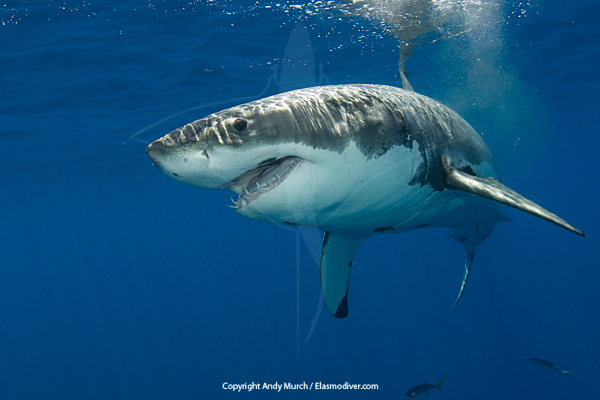 We are hoping to photograph a dozen species of sharks that have not been filmed in the wild. 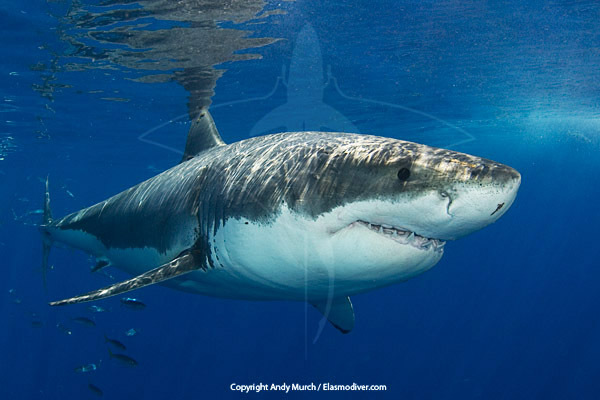 Many have been virtually eliminated by over fishing and the images will be very useful for conservation groups that are trying to protect the sharks that are left. How we raise a budget for a new vehicle and other expenses are just details. The sharks may not be there much longer so we have to go. 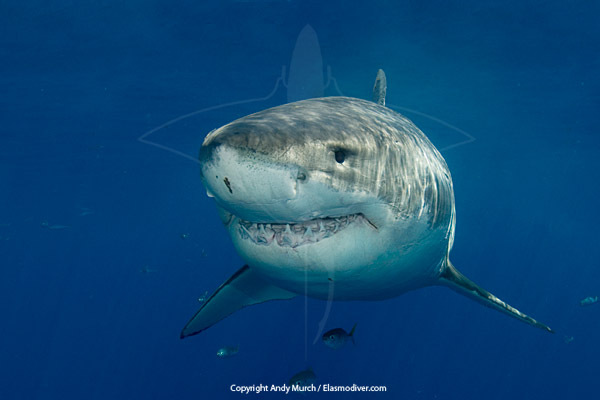 Andy is a Photojournalist and outspoken conservationist specializing in images of sharks and rays.